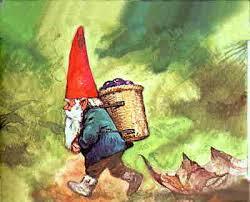 Woodland Gnome Or forest gnome is the most common, resembles ordinary gnome. Kind, helpful, avoids contact with man, mischievous sense of humour. 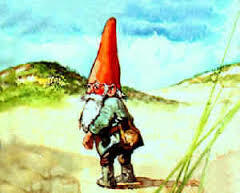 Dune Gnome A fraction larger, he too, avoids contact with man. Garden Gnome He lives in old gardens, even those hemmed in between new houses. Rather sombre and enjoys telling melancholy tales. He is quite learned, sometimes feels out of place in the woods. 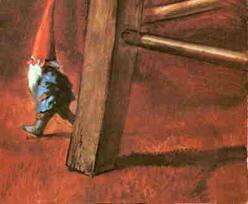 Farm Gnome Resembles the house gnome good natured but is of a more constant nature and is conservative in all matters. 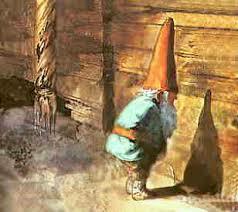 House Gnome A special sort resembling an ordinary gnome, he has the most knowledge of mankind. Owing to the fact that he often inhabits historic old houses, seen and heard a great deal. He speaks and understands man’s language. Good-natured, always ready for a lark or to tease; never malevolent. 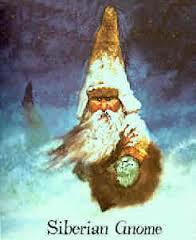 Siberian Gnome He is centimetres larger than the European type and associates with trolls. In certain regions they are not to be trusted, taking revenge for the slightest offence by killing cattle, causing bad harvests, droughts, abnormally cold weather, and so forth. The less said about him, the better. 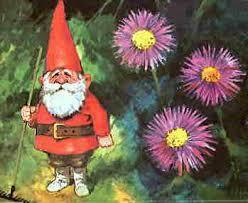 Please visit our ‘Nisse not Goblins or Trolls’ page for a description of the various characters often mistaken for Nisser.